VMB-443 was commissioned at MCAS Cherry Point on 15 September 1943 and transferred to MCAAF Camp Lejeune on 20 October to continue training. In mid-January 1944, the air echelon and some of the ground echelon went to Naval Auxiliary Air Station (NAAS) Boca Chica, Key West, Florida for torpedo training and tactics and then moved to MCAS El Centro in February in preparation for overseas assignment. Thanks to www.militaryhq.com for the information. VMCJ-1 was commissioned at MCAS El Toro on 31 July, 1958 with the merger of VMJ- and VMC-1 . It was the last of the VMCJs to standup and remained at El Toro when VMCJ-3 deployed to Japan in August, 1958. Under the leadership of Lt. Colonel Albert James, who took command on 31 August, the squadron transitioned to the F8U-1 P photo reconnaissance aircraft and the F3D-2Q EW aircraft before departing CONUS to relieve VMCJ-3 in November, 1959. Thanks to www.mcara.us for the information. VMD-354 was commissioned on 1 July, 1943 at MCAS Cherry Point and began training with a PBY-4/B-2-4D multi-engine aircraft, the same type being flown in combat missions by VMD-154 in the South Pacific. In February, 1944 the squadron received its first F6F-3P Hellcats but continued to train in both types. Marine Fighting Squadron 215 (VMF-215) was a fighter squadron of the United States Marine Corps that was activated and fought during World War II. Known as "The Fighting Corsairs", they fought in many areas of the Pacific War , including the Battle of Bougainville. During their four-and-a-half month tour, the squadron was credited with shooting down 137 enemy aircraft, fourth most in Marine Corps Aviation history. VMF-322 was reactivated during the Korean War on July 6, 1951 again flying the F4U Corsair. 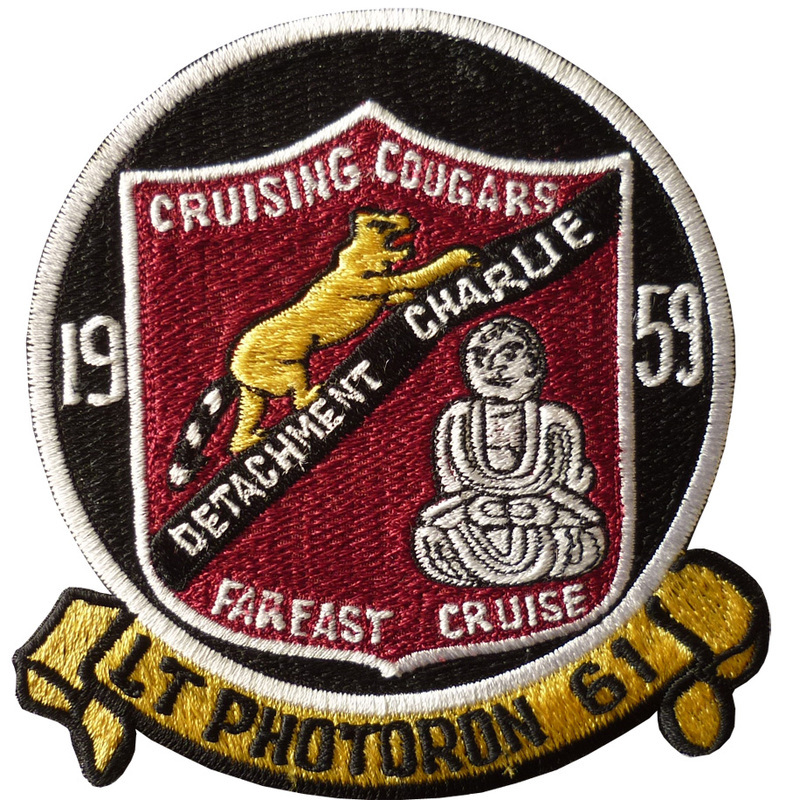 The squadron moved to Naval Air Station South Weymouth in January 1954 and transitioned to the F9F Cougar in March 1955. The squadron changed it name to Marine Attack Squadron 322 (VMA-322) in May 1958 and changed aircraft again, this time to the FJ3 Fury n November 1959. In September 1962 the squadron received its final aircraft in the venerable A-4 Skyhawk. The 351st United States Marine Observation/Fighter Squadron (VMO/VMF-351). The unit was commissioned as an observation squadron but received fighter training and was redesignated as a VMF on January 31, 1945 when stationed on board the USS Commencement Bay and later on the USS Cape Gloucester. The patch shows the head of a great bulldog with devil horns. In 1984, VMFA-451 set a safety record of 29,000 accident-free hours in the Phantom. After 21 years in the venerable "Rhino", and led by Alfred Cunningham award winner Lieutenant Colonel T.D. Seder, the "Warlords" exchanged their McDonnell Douglas F-4S Phantom II for the F/A-18 Hornet in September 1987. 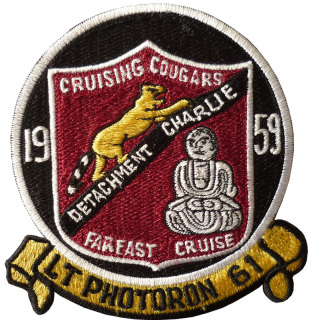 In May 1989, the squadron again sailed with the USS Coral Sea (CV-43) for a Med Cruise to end an eight-year absence of Beaufort-based Marine units on carriers. VMF-512 was initially formed in February 1944 as part of Marine Aircraft Group 51 (MAG-51). The first CO was Maj. Edward Finn but on March 17, 1944 Maj. Blaine Baesler took command, a position he held until the end of the war. MAG-51 was formed January 1, 1944 and shortly thereafter the 4 fighter squadrons VMF-511, 512, 513 and 514 were commissioned. Thanks to www.adamsplanes.com for the information. Bill: We love your UFO Hunters show and the patch on your jacket is fantastic, we thought a lot of your fans would love to wear what you wear. On October 1, 1943, Marine Night Fighter Squadron 533 (VMF(N)-533) was commissioned at Marine Corps Air Station Cherry Point, North Carolina.Originally known as "Black Mac's Killers", after their first commanding officer Major Marion M. Magruder they were one of three night fighter squadrons to be activated in the Marine Corps and were outfitted with the Grumman F6F-5N Hellcat, equipped with the APS-6 radar. Marine Tactical Reconnaissance Squadron 3 (VMFP-3) was an aviation unit of the United States Marine Corps active between 1975 and 1990.VMFP-3 was activated on July 1, 1975 as part of the 3rd Marine Aircraft Wing at Marine Corps Air Station El Toro, California (USA). The squadron was deactivated on 30 September 1990. Established as Patrol Squadron TWO HUNDRED THREE (VP-203) on 1 October 1942. Redesignated Patrol Bombing Squadron TWO HUNDRED THREE (VPB-203) on 1 October 1944. Disestablished on 30 June 1945.